Urbotek takes place in an alternative shadow world of modern urban culture, where characters collide with working life and search for fulfillment in radical ways. Race Horse Company’s trademark style combines ‘acrobatics with attitude’ with abstract depictions of our society. 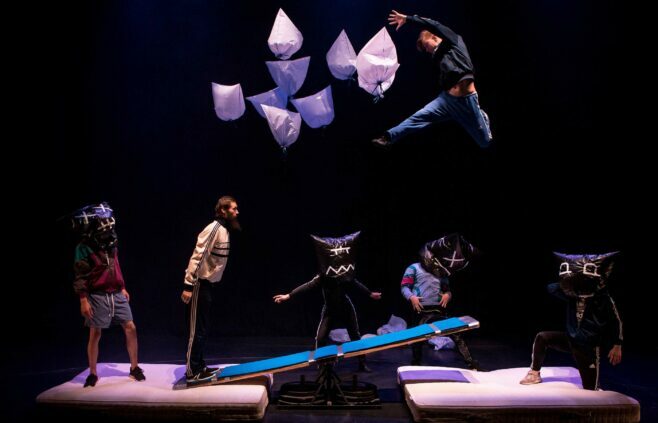 Their ambition is to present a fresh, thought-provoking work that blends the borders of contemporary and traditional circus in ways that are surprisingly touching and thoroughly entertaining. Race Horse Company was born in 2008 from the need to create an uncompromising, personal and completely new kind of contemporary circus. Their rough-and-ready performances are based on the aesthetics of chaos, humour and surprise. The company received the Finnish State’s Award for Circus Arts in 2016, and has been at the forefront of the success story that is Finnish circus. Shows that have toured internationally include Petit Mal, Super Sunday, Motosikai and Around. With the support of Finnish Cultural Foundation, Cirko Center for New Circus, La Brèche – Pôle national des arts du cirque de Normandie, Stoa, CircusInfo Finland. Race Horse Company – Urbotek – Trailer from Race Horse Company on Vimeo.